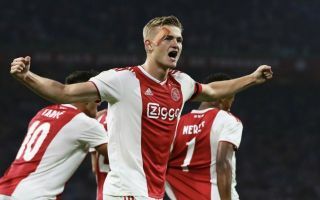 Matthijs de Ligt produced a moment of magic for the Dutch giants in the Eredivisie on Sunday, as he continues to be linked heavily with Barcelona. The 19-year-old is reportedly a transfer target for the Spanish champions, who are confident of securing his signature next year after a positive meeting with the player’s representatives – according to Bleacher Report. The Netherlands international has been showing exactly why he has attracted the interest of one of the world’s biggest clubs with his latest domestic performance, as he found the back of the net against ADO Den Haag. Ajax are currently 4-1 up against the 13th placed Eredivisie outfit and De Ligt grabbed the third goal just before half-time, firing home a stunning 25-yard effort which underlined just how talented he is. The young defender is primarily known for his skills at the back, but this latest strike just shows that he can also be a big threat in the attacking third of the pitch. Check out the goal which is sure to get Barca fans across Spain talking below, via Twitter.